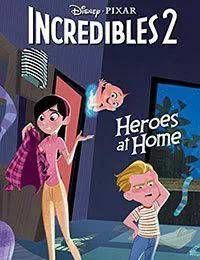 Interwoven with the events of the film, the kids of The Incredibles super family, Violet, Dash, and Jack-Jack, have adventures of their own in two tales where they balance their everyday lives with being secret Superheroes.While their mom and dad--Mr. Incredible and Elastigirl--are both taking on new and very different jobs, Dash and Violet are doing their best to help out! First, Dash and Violet become sudden and secret superheroes when they interrupt criminal activity on a routine grocery trip to pick up some essentials! Then, helping out at home, their efforts to keep up on their chores are unknowingly obstructed by the innocent mischief of their little brother, Jack-Jack!This comics collection, written by Liz Marsham (Batgirl Classic, Wonder Woman Classic, Disney Princess Beginnings, Harley Quinn: Wild Card), and illustrated by Nicoletta Baldari (Star Wars Adventures: Forces of Destiny, The Powerpuff Girls), features stories that are accessible for the young reader--but enjoyable for everyone! Also included in this volume are a variety of story-related activities and a special feature on how comic books come to life!